I will mix and let sit for twenty-four hours and will pitch my yeast after 24 hours. I may also put cinnamon and cloves in a cheese cloth bag for flavoring, as well. 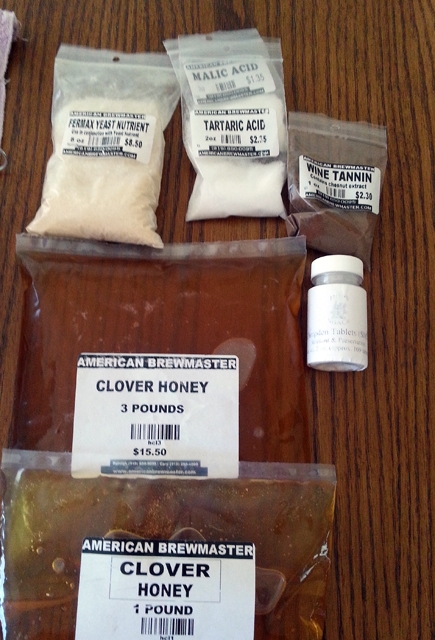 Four pounds of clover honey. Malic and Tartaric acids, plus grape tannin. Cinnamon and clove with golden raisins. 3/9/15, Monday: So I pitched my yeast yesterday, and yet, again, NOTHING is happening, so I threw another dozen golden raisins into the must. No bubbling, no nothing. Should probably do an SG reading, but I’m tired, it’s been a long day, and I’ll check it again tomorrow. 3/10/15, Tuesday. WTActualF? Gravity moved, but in the wrong direction. 1.130. Seriously????? Re-yeasted. 3/14/15, Saturday. (Johnny’s birthday, Pi Day and also Steak & A BJ day for those of you following along…) Last night I checked the SG (1.140!!! WTH? ), added more honey (12 additional ounces), stirred like a fiend and moved the batch into the cleaned “Mr. Beer” keg. It dawned on me that I still had the active yeast and some must sitting all nice and dormant in the refrigerator. I set it out overnight, warmed it to about 90 degrees this morning, shook it up and added it to the must. If it’s going to die, I want to bury it after having made every attempt at saving its life.